We are happy to announce that we are hosting a youth photo competition. The Images entered will be used at a photography exhibition on 16 June where a winner will be chosen and announced. Entry is free and all up to the age of 21 years can enter. Images has to be of the Dwarsriver valley; the people or the place. 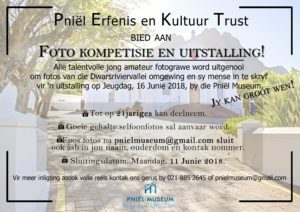 Email your image to pnielmuseum.co.za together with your name, age, contact details and why you took the photo or what it means to you.